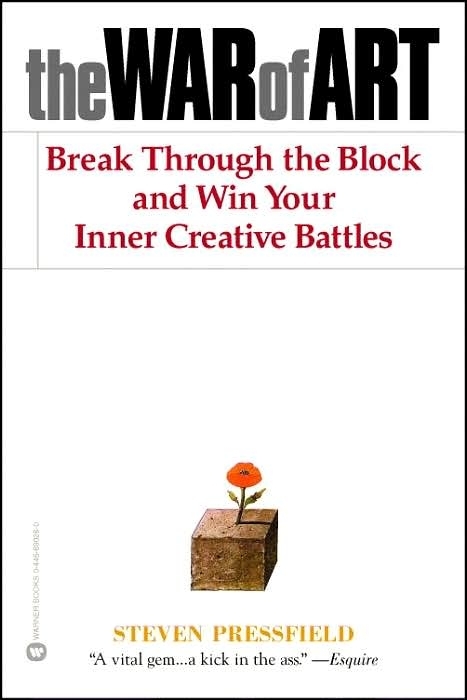 A fun quick read on productivity and creativity, beating your "inner resistance." Skip the last 1/3 about angels and god. We always end up facing a death wish, the tough long term struggle that could end up doing us some good. Your only goal each day should be to overcome resistance. “Resistance” is the urge to procrastinate, delay, wait, the belief that you’re not ready, in sum anything that gets in the way of the artist creating his or her art. We all are haunted by the visions of the person we could be but aren’t. The difference is the Resistance at work, Resistance holds us back from acheiving that ideal self. Things that create resistance: artistic expression, entrepreneurship, diet, spiritual improvement, exercise, breaking habits, education, helping others, emotional commitment, being principled in the face of adversity. Resistance is internal, we all create it inside of ourselves. The more important and true to our calling something is, the more resistance we will feel towards it. Resistance never goes away, we just learn to better deal with it. Resistance gets stronger closer to the finish line. Resistance recruits allies, your friends and family will try to hold you back out of their own resistance (see subconscious sabotage). The best thing you can do for another artist is to serve as an example. All forms of indulgence are expressions of resistance. Instead of applying self-knowledge, self-discipline, delayed gratification and hard work, we simply consume a product. Someone is free only to the extent of their self mastery. People criticize out of resistance. When they see someone living their authentic selves, they bring them down to feel better about themselves. The more afraid of something you are, the more you can be sure that you have to do it. If you didn’t love what you’re doing, you wouldn’t feel anything. Resistance is love. The professional knows that if he gives in to resistance today, it will be twice as strong tomorrow.